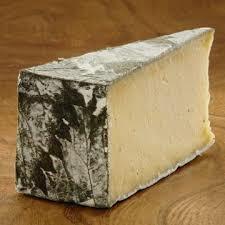 Just to fill in a small gap here, last week’s Cheese of the Week was Cornish Yarg from Lynher Dairies. Yes, that does look like a leaf on the rind – Yarg is famously wrapped in nettles, making an edible rind. The cheese itself has quite a mellow flavour, and a giving texture, becoming crumbly towards the core. A Gold Award winner at the recent British Cheese Awards no less.